I am so excited…….. Lynette Haggard has fabulous interviews with other artists. A short time back she wrote me to ask if I would like to be her next interview on the blog. One of my favorite reads online are the art blogs…. and especially the interviews with other artists. It’s fun to have a little insight into the lives and studio practices of various artists I know….. or who I would like to know more about. Lynette’s is one of my favorites. She is so articulate, and also a wonderful artist in her own right. I know most of my closer friends will know all the information but for you who don’t, I hope you will enjoy the interview. Here is the link to my specific interview. Strange I know, but after returning from the Encaustic Conference in Provincetown, MA………..I have not had a spare minute to work with encaustic. First I got sick, then I had an out of town workshop to go to for a week. Then I got home with all the myriad of things to catch up on when you have not being doing much of them for a month. When I did get back into the studio I had work on canvas to finish up…and some new experiments with oil and cold wax medium. Not to be one to start three projects at once…………..I waited until this afternoon to start up the melting of the wax. Nothing like waiting until about the 25-30th straight day of over a 100 degrees to melt wax is there? I had been just thinking a lot about using this new super Hake brush I saw and ordered at the conference…along with it’s own pan. Whoa…. all 7″ wide. I didn’t really get to use the special pan today as it didn’t get heated up enough although my trusty electric skillet did a fine job of it. NICE to not have to make so many strokes across the board when priming my boards with medium. 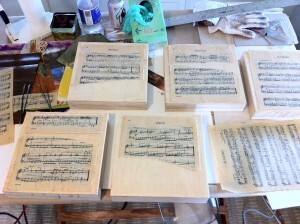 Today I am working on five 10 x 10 x 2 inch wood panels…. I need four for a project but I had a full box of five…so why not? I already had played around with my Paula Roland hotbox back some time ago just making collage papers or coating found papers with wax medium and allowing them to dry. SO, now I have papers all over the place and want to start. WHERE am I going to start? No clue really, but I finally decide to just begin with some sheet music papers I had. So I coated some more of them as I had only done a few previously. And I started looking through the papers for colors I might use for these pieces. I just have to go for it and see what happens. 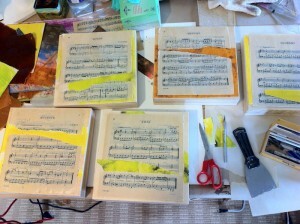 I don’t know how much of these torn pieces of sheet music will show up in the final paintings. For now, I just tore them and laid them on the panels with two layers of medium on the boards. For now they are not down permanently. I am just moving stuff around and playing with arrangement. I may or may not put any color under the pages…for one thing, if I do, it will show through the sheet music. SO for now… I won’t. With all this black and white (gray)… I need some color so I am trying out bright color like yellow and yellow greens………I cut it to fit in between the torn areas and just where ever the color and shapes take me. It’s getting hotter in here people. I have to make a few more pieces since of course, I don’t have the colors that came to mind. That hot box is going and I am making a cad green pale paper…cool (I wish). More arranging and cutting and tearing. I also went with a bronzy color for one……. I finally decided to call it a day..umm, afternoon and left these as they are, not fused down or anything….but maybe ready for a cooler morning than it is right now in late afternoon. I decided I had worked long enough on those little 8 x 10 inch canvases trying out the oil and cold wax. I can’t get the gesture in little paintings. I am better off working with collage when I work with a more intimate size. I got out a large (and heavy) 32 x 32 x 2 inch wood panel and set to work. First, since this is oil I needed to gesso this panel I had made for hot wax that should not use acrylic gesso. I got out the gesso I had not opened in who knows how long. It was pretty thick since it was in a gallon pail and I had half of it in there. It was really thick but worked fine. 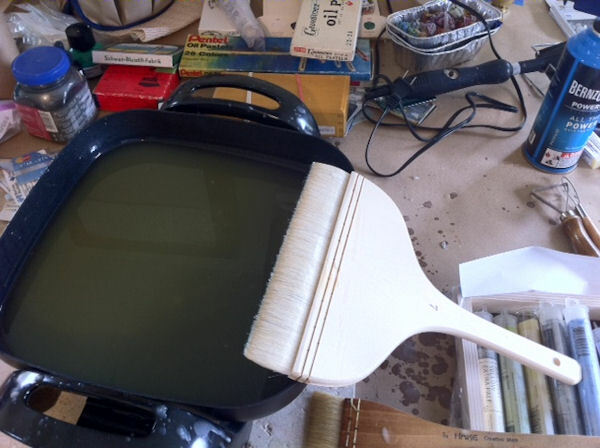 I laid in two coats and ten decided …what the heck I would also put some lightweight texture paste since it was okay for oils as well as acrylic painting. The next day I started mixing up the cold wax medium ( I only had a pint of Gamblin) with some variations of yellow, yellow orange and a tinge of red. I used a good bit of the medium and troweled and brayered it all around until it was covering the face of the panel. Oh yeah… I taped the edges of the panel except for the 1/4 inch face of the plywood that I planned to have paint on in the end. This is slower going that applying the ground with acrylic on canvas I can tell you. I had some violet paint out on the palette so I just dipped into it and made marks with the diluted violet and a brush like I might usually do with my acrylic paintings. The only instructions I have for working with cold wax come compliments of Rebecca Crowell and her ning site, oilandwax.ning . Since Rebecca works so much differently than I do, I just have to wing it except for reading about the things I can or cannot do and there are not that many of them since you don’t have to think of some of the technicalities of oil painting alone. The cold wax medium helps all the paints to dry without thinking of fat over lean, etc. 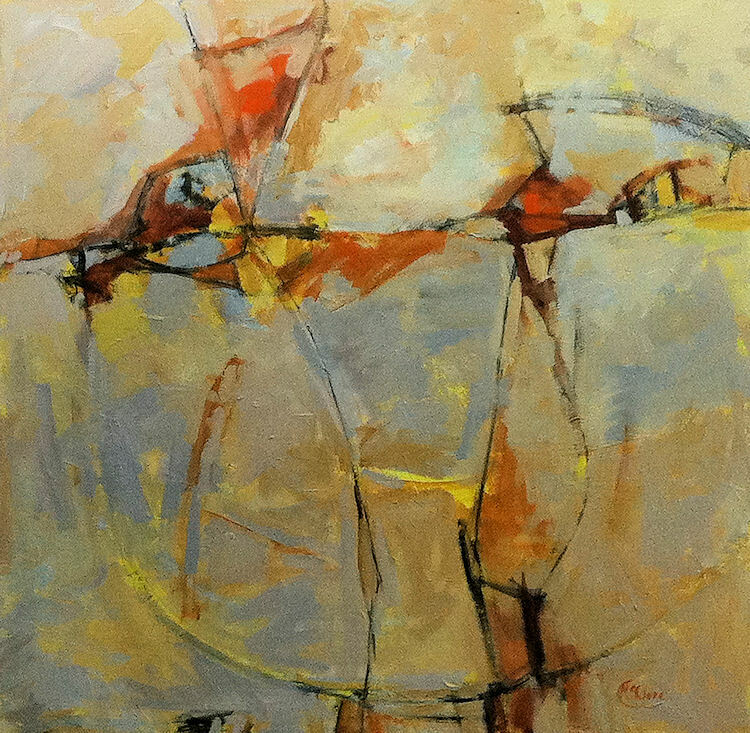 I was going to post the picture but it is on my FB Contemporary Abstract Paintings page here. I have continued to work on this painting……..Ialso posted another layer on down the line on the FB page…………. This is what I have now. This painting may get a little more work. In fact, it almost for sure will. I don’t have plans at this juncture to make a big about face and change it totally. It looks like my paintings pretty much except in person, it is different due to the nature of the oil and wax. I still have not gotten to the point of using a retouch varnish or final varnish yet so these paintings will have a little more luster. They are matte in nature with the wax medium and some people prefer that. I am used to the more satin finish of my other work. I’m already thinking…. what to title this as it initially used colors I think of in spring….. Maybe it should be titled, “Wishing for the Heat to End”. It also makes me think of the pastures down toward the creek bottom here. Oh my gosh… I got so busy back in May that I forgot entirely MaryBeth Rothman’s blog on collage, assemblage and bricolage. Darn… I had work she so graciously exhibited in that edition of her fantastic blog. She does such a fantastic job of talking about her art (and others)…….how could I have not posted this sooner. Never too late, I hope, as I saw today this post on the second part of this great post with other artist’s work. So… go check out all this great work that MaryBeth has brought to us all through her blog. 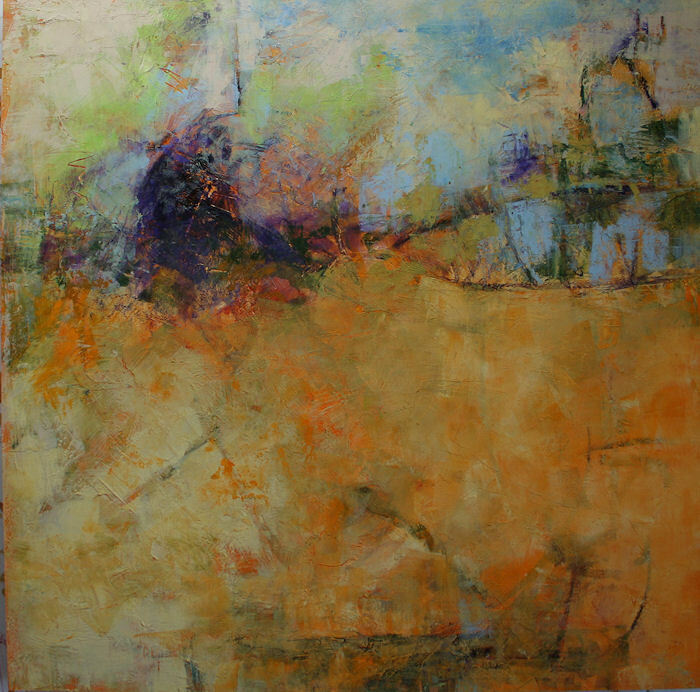 I promised I would let my workshop participants see the work I started on the last day with a cadmium yellow ground. This painting bears little resemblance to what it looked like yesterday. That is me… I go with the mood of the day. SO what is the mood of the day? All day it is still hot, cloudy, and then hot sunny. Still, then windy……..maybe another little thunderstorm that doesn’t really have much rain in it again this afternoon.